Avengers: Infinity War wrought death and destruction pretty much everywhere we looked. There’s no hope for our MCU heroes heading into Avengers 4, is there? Wait, don’t buy all of your tissues in bulk just yet. One theory (which is actually kinda obvious when you think about it) sees a Marvel superhero possibly make it out to the other side. Nerdist has laid bare the tree-mendous theory, so here’s the gist of it: Remember Thor’s journey to craft Stormbreaker? Yeah, it didn’t go too well. Something about waking up a dying sun yadda, yadda, yadda. It all ended up with Groot doing what all good teenagers should do and sacrificing a limb (and his video games) so a mystical god could wield an axe to stop a giant purple tyrant. And I thought my university days were wild. Now, think back to Guardians of the Galaxy. Groot, much like during Infinity War, died there too. As in Infinity War, though, a piece of him remained. There, a lonely twig, here: a whole arm wielded to Thor’s new plaything. That’s the key to the resurrection theory. No Quantum Realms here, no siree. So, is Groot still alive? 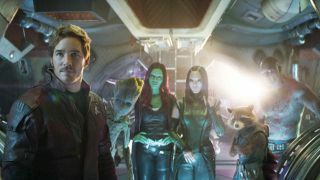 That theory makes a good a case as any for Rocket Racoon not to be the only remaining Guardians member. I’m kicking myself for not thinking of it. It’s so darn straightforward that it just might work. It sets the stage, too, for the pair of Rocket and Groot to reunite. in rollicking style come Avengers 4. As long as he’s controlled that pottymouth of his, that is. Of course, the movie has a lot more than Groot to dissect, so be sure to read our root-and-branch look at the Infinity War ending.